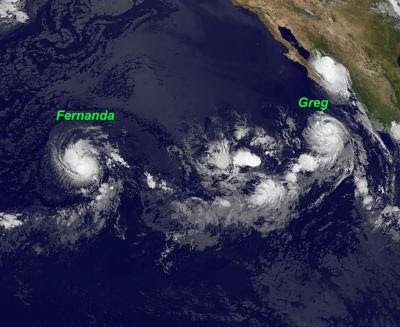 Hurricane Greg and Tropical Storm Fernanda were seen approaching the Central Pacific Ocean near the Western coast of Mexico while the hurricane and tropical storm maintain their strength. The Geostationary Operational Environmental Satellite called GOES-11 caught an image of eastern Pacific on August 18 at 1200 UTC (8 a.m. EDT) saw Tropical Storm Fernanda approaching the central Pacific Ocean and Hurricane Greg behind her in the eastern Pacific Ocean. Hurricane Greg and Tropical Storm Fernanda images were created at NASA's GOES Project, located at NASA Goddard Space Flight Center in Greenbelt, Md. NOAA manages the GOES-11 satellite and NASA uses its data to create images and animations. At 11 a.m. EDT (8 a.m. PDT) Greg's maximum sustained winds were near 85 mph, making him a category one hurricane on the Saffir-Simpson Scale. He was moving to the west-northwest near 18 mph and is forecast to move in a more westerly direction in the next couple of days. 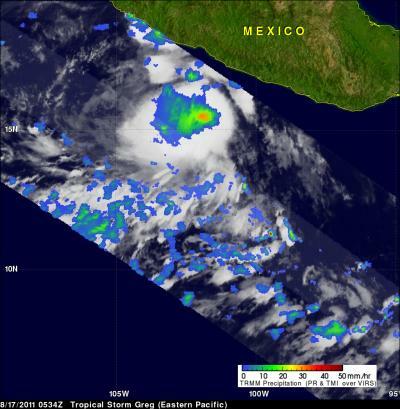 Greg was centered about 320 miles south-southwest of the southern tip of Baja California near 18.5 North and 111.5 West and was passing Mexico's Socorro Island. The automated weather station on the island reported sustained winds of 38 mph and a wind gust of 53 mph. NASA's Tropical Rainfall Measuring Mission (TRMM) satellite saw Greg as a tropical storm on August 17 at 0534 UTC. At that time, TRMM's Microwave Imager showed that intense convective thunderstorms within the developing storm were dropping rainfall at rates greater than 30mm/hr (1.2 inches) in an area near the center of the storm. Greg's rainfall rates have increased as he strengthened into a hurricane. Greg is forecast to move into cooler waters in three days, at which time he will begin to weaken. In the meantime, he continues to chase Fernanda through the Eastern Pacific Ocean. Meanwhile, Fernanda's maximum sustained winds were near 65 mph, just 9 mph shy of hurricane status. She was located about 1040 miles east-southeast of South Point, Hawaii near latitude 13.7 North and longitude 141.0 West. Fernanda is moving toward the west-northwest near 13 mph and is expected to take a more westerly track in the next 48 hours after which she's expected to weaken because of adverse atmospheric conditions. Fernanda and Greg are now about the same size. Fernanda's tropical storm-force winds extend outward up to 80 miles from the center. Greg's tropical storm-force winds extend to about 85 miles from the center, while his hurricane-force winds extend 25 miles out.